Tucson’s million dollar home sales November 2016 continue to show strong gains. After 5 plus years of weak sales, million dollar home sales are improving. Albeit not at prices seen in 2006/2007. Buyers looking for great value. In March 2015, a 1,000 SF. fixer upper in La Jolla, California sold for just under $1 million. Yes, the Pacific could be seen from the second story bedroom. Small lot, small home, BIG price! Tucson is benefiting as buyers from California and the Northeast see the value. Selling a multi-million dollar home in San Francisco, Los Angels, Boston or New York and buying a Tucson luxury home is makes sense to a lot of people. Plus, there will be money left over to enjoy everything Tucson Arizona has to offer. The City of Tucson sits in the Sonoran Desert and surrounded by five mountain ranges. This unique setting creates the opportunity for luxury homeowners to have spectacular mountain and city light views. Views that are unmatched by any other city in Arizona. Now let’s not kid ourselves, while the sales of million dollar homes in Tucson is improving, buyers are still in control of this market segment. Most million- dollar homes are selling under the list price. Some significantly! And prices have not recovered from the peak in 2007. Million dollar homes can be found in most areas of Tucson. However, they are found in greater numbers in the North, Northwest, Central and Northeast areas. The North area of Tucson is know as the Catalina Foothills. Why? Well, the area sits in the foothills of the Santa Catalina mountains just north of the City of Tucson. A million dollars in the North will buy you a home with a large lots, great city lights views and the Tucson mountains as a backdrop. The northwest area is about 10 miles north of the City of Tucson. 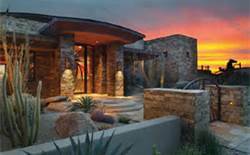 Many homes valued at a million dollars or more will be in Oro Valley and Dove Mountain. The Pusch Ridge view of the Santa Catalina mountains is a stellar backdrop for homes in Oro Valley. Dove Mountain provides views of the Catalina Mountains, Tortolita Mountains, Tucson Mountains and Tucson city lights. The central area offers million dollar homes with lots of charm and historical distinction. Homes are close to the vibrant city activities and the University of Arizona scene. Many million dollar homes in Tucson’s East and Northeast areas will be horse properties. Homes have large lots and many have horse facilities on the property. The west side of Tucson will have million dollar homes located in the Tucson Mountains. While fewer in number, homes will have spectacular views of the city lights and Catalina Mountains. Luxury homes valued at a million dollars or more are seeing increased sales. See all prior reports on million-dollar home sales – HERE. The great thing about buying a million dollar home in Tucson is what you get for the money. A comparable home in Scottsdale AZ would be 3 to 5 times the price. In Tucson, you will also get cooler temperatures, majestic sunsets and a lot less traffic. Interested in a million dollar home in Tucson AZ as a year around home or winter retreat? We can help! We are a top Realtor team serving Tucson and its surrounding communities. Give us a call to discuss your interests in owning a home in Tucson – Oro Valley – Dove Mountain or other areas – 520.940.4541.